Did Darwin see evolution as progressive, directed toward producing ever more advanced forms of life? Most contemporary scholars say no. In this challenge to prevailing views, Robert J. Richards says yes--and argues that current perspectives on Darwin and his theory are both ideologically motivated and scientifically unsound. This provocative new reading of Darwin goes directly to the origins of evolutionary theory. Unlike most contemporary biologists or historians and philosophers of science, Richards holds that Darwin did concern himself with the idea of progress, or telos, as he constructed his theory. Richards maintains that Darwin drew on the traditional embryological meanings of the terms "evolution" and "descent with modification." In the 1600s and 1700s, "evolution" referred to the embryological theory of preformation, the idea that the embryo exists as a miniature adult of its own species that simply grows, or evolves, during gestation. By the early 1800s, however, the idea of preformation had become the concept of evolutionary recapitulation, the idea that during its development an embryo passes through a series of stages, each the adult form of an ancestor species. Richards demonstrates that, for Darwin, embryological recapitulation provided a graphic model of how species evolve. If an embryo could be seen as successively taking the structures and forms of its ancestral species, then one could see the evolution of life itself as a succession of species, each transformed from its ancestor. 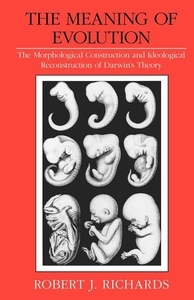 Richards works with the "Origin" and other published and archival material to show that these embryological models were much on Darwin's mind as he considered the evidence for descentwith modification. Why do so many modern researchers find these embryological roots of Darwin's theory so problematic? Richards argues that the current tendency to see evolution as a process that is not progressive and not teleological imposes perspectives on Darwin that incorrectly deny the clearly progressive heart of his embryological models and his evolutionary theory.